For my book, I just read Robert Temple’s The Genius of China (1998), which is a popularization of Joseph Needham’s decades-long project to recover and inventory the science and technology of China. Now, I’m 90% satisfied with the book. For most of its history, China was not only ahead of Europe– which wasn’t that hard to do– but ahead of the Mediterranean and Middle East. It had more intensive agriculture, more sophisticated government, a more inclusive religious atmosphere, and a jump start on any number of technologies: paper, porcelain, gunpowder, printing, the wheelbarrow, the spinning wheel, canal locks, watertight bulkheads, cheap cast iron, the compass, even mathematics and equal temperament in music. Nor is this, as a general principle, surprising: you’d expect the planet’s richest and most populous civilization to be its most advanced, and so it was. It’s not a bad bet that in a few centuries, when we finally enter galactic civilization, we won’t be known as Terrans but as Dìqiúrén. The Master said, Some have made flying cars with wood from the inner part of the jujube tree, using ox leather straps fastened to returning blades so as to set the machine in motion. Others have had the idea of making five snakes, six dragons, and three oxen to meet the “hard wind” and ride on it, not stopping until they have risen to a height of forty lǐ [13 miles]… This account comes from the adepts and is handed down to ordinary people, but they are not likely to understand it. Needham concedes that we have no evidence of the sort of machines Gě describes, but as for the kites, he thinks “there would have been really nothing to prevent it.” Reeeeally, Joe? That’s the sort of dodge you use when you really really want to believe something. Temple helpfully provides a picture of a hang glider to help the claim sink in. Surely flight is one of the things attributed to sages all over the world? The Siberian shamans and Castaneda’s Don Juan were supposed to be able to flit about using the spirit world; TM dudes are said to levitate; witches fly on brooms; the Monkey King could jump 108,000 lǐ at a time. In Matthew 3, the devil takes Jesus to a mountain tall enough to see “all the kingdoms of the world”. Gě Hóng goes on to support his notion of a high gale by appealing to how dragons fly. Reading an alchemist literally is generally not a good idea. In other cases my question is, if you pored over the Western and Arabic historical record, mightn’t you find a large number of surprises? The Greeks and Romans were loquacious on their philosophy and politics, tight-lipped on their engineering. E.g. knowledge of the Antikythera gear work was lost for millennia. A few pages after the hang gliders, Temple remarks “For most of history, Europeans used ships which were drastically inferior to Chinese ships in every respect imaginable. They had no rudders, no leeboards, no watertight compartments, single masts, and square sails…” Which is simply wrong. Roman ships had rudders and multiple masts. 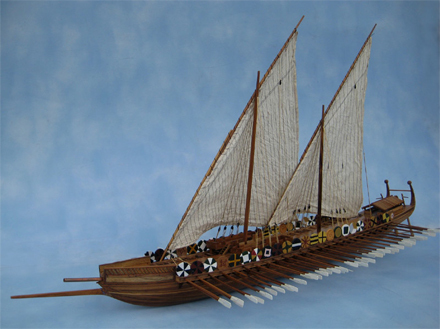 The Byzantine dromon, shown above and used throughout medieval times, had multiple masts and triangular sails. Needham often suggests that any particular Chinese discovery must have found its way to the West. This is frustrating, as in fact science is full of multiple independent discoveries. Now, sometimes he has good clear evidence: e.g. he has a 1787 quote from Ben Franklin suggesting that mail ships be built with watertight bulkheads “after the Chinese manner”. But the monogenesis of ideas is a terrible heuristic. Temple’s cheerleading gets tiresome at times— e.g. the last section, on warfare, says “No nation in the world could match the Chinese expertise in warfare for two millennia.” Except, you know, China was conquered twice by northern nomads, and northern China several times more. And China, for all its might, was remarkably unsuccessful at expanding into Korea and Vietnam, despite multiple tries. I think the problem here is that Temple confuses invention with mass deployment: they had land mines! burning gas! cannons! repeating catapults! Well, yes, but it’s far from clear that these were manufactured in sufficient quantity, or used with sufficient skill. Everything in China was at huge scale, but so were the logistical problems. So far as I can see, China’s government was always underfunded, and its army was subpar for an empire its size (not least because its elite was– unusually for the premodern world– not drawn from the military). Anyway, it’s still a fascinating book. As I say, I don’t have problems with 90% of it. It’s just that a few bits rang my skepticism meter.